This post originally appeared on Environmental History Now, a website dedicated to showcasing the work and expertise of graduate students and early career scholars in environmental history who identify as women, trans and non binary people. Every day on my commute to the Special Collections at Syracuse University this summer, I drove past the Port Byron Erie Canal Heritage Park. On the last day of my research trip, I decided to stop and look around. Inside the restored tavern and flophouse—alongside memorabilia, family photos, and explanatory placards—was an enlarged photo of a grinning dog. He belonged to the Van Detto family who ran the establishment in Port Byron’s heyday, and when I asked a docent about him, she shrugged. “We don’t know much. We saw from their photos that he was important to them, so we thought we would make a place here for him.” Animal history is a central feature of the Port Byron exhibits given the site’s reliance on mules to drag barges along the canal locks, but the Van Detto’s family dog’s unexpected cameo is an excellent reminder that animals’ influence on history permeates the archive beyond their economic or nutritive contributions to human societies. In The Historical Animal, Susan Nance writes “Animal History directs us to document the lives of historical animals as an intrinsically valuable history through which we can better understand nonhumans and ourselves […] invites us to ask unconventional questions about the interspecific past in non-anthropocentric ways […]” While they are often overlooked, the archive is full of animals, and centering them in historical narratives offers historians a powerful tool for reexamining those narratives. My dissertation research focuses on public memory and the Plains Wars of the late nineteenth century, and on these research trips I stumbled into horses at every turn. I expected to find them in documents like ledger art and cavalry reports, but references and images of horses were tucked into every nook and cranny, from photographs to memoirs, from correspondence to historical textbooks. These archival horses performed a full range of historical work. In U.S. Army reports of the Battle of the Greasy Grass (and more rigorously, historians’ arguments over these reports), fallen cavalry horses served as crucial evidence to piece together the events of day’s battle. It was the custom for cavalry units to assign regimental mounts based on the horses’ color to maintain easy visual communication on the battlefield, and General Custer’s Seventh Cavalry was no exception. Well into the 1930s, correspondence between historians and Plains Wars veterans included questions about misplaced fallen white horses to sort the chaos of that day. Horses also actively participated in historical events, shaping their course for their riders in substantial ways. Veteran Frank L. Anders reminded researcher R.G. Cartwright of a moment early in the Battle of the Greasy Grass when two of Reno’s men were “carried into the Indian camp due to unruly horses.” In John Watermelon Redington’s case, the physical limits of his horse prompted a dramatic career change. The young newspaperman on his way to cover the Nez Perce War found himself stuck in Salt Lake City with a horse who could go no further. Failing to sell the horse for train fare, Redington joined up instead. His footsore horse sent Redington into two wars as a U.S. Army scout, a robust publishing career, and lengthy correspondence with western historians seeking to understanding wars on the Plains. Some horses carried more than tramp printers or cavalry officers on their backs. Colonel Miles Keogh’s famous Comanche carried valorized historical memory from the battlefield to the rest of the country and, through children’s books, popular histories, and his own body’s preservation as a museum exhibit, kept carrying it long after his death. Historians couldn’t resist the story of the lone survivor of the battle, faithful mount of brave young Keogh, saved, nursed back to health, and retired in honor of his service in the U.S. Army’s most disastrous defeat on the Plains after the Civil War. Debates over Comanche’s experience and even his identification in photos appear in veterans’ memoirs and historians’ correspondence from the late nineteenth through the late twentieth centuries. When I went to these archives, I thought my dissertation research would focus on the correspondence and publications that shaped public memory. But like the horses at the ranch where I ride pushing their soft noses against my hands in search of treats, these archival equines kept nosing me until I had their full attention. These horses facilitated and shaped the historical events that became memory. 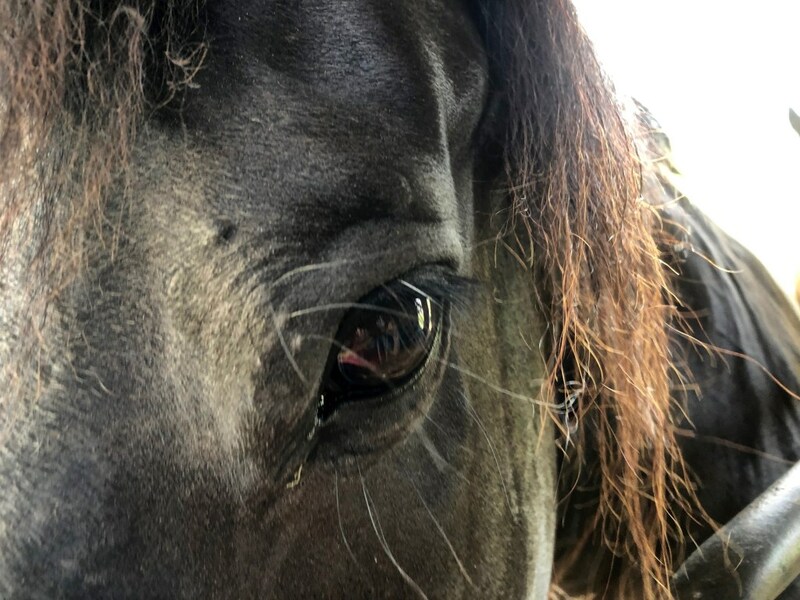 Centering horses in these narratives and seeking to understand their experiences as best we can offers historians a new lens for examining the past and our relationship with it. Comanche’s perennial reappearance in historians’ correspondence and popular histories reminds as that, as Sandra Swart argues, “The social history of the human-horse relationship reveals how its experiences alter in time (and space) and concomitantly so does the social experience of that relationship […]” Horses survived battles all the time; it was Comanche’s connection to Keogh, and that relationship sentimentalized and valorized, that drew people to this horse as a witness to battle that shocked settler America. More important, taking these animal experiences and relationships seriously, from Comanche to the Van Detto family dog, urges scholars to question our assumptions and frameworks. Swart points out that a focus on animals points historians back to the material, tethering representational theories firmly in the physicality of the past, and entwining intimate histories with the larger stories we explore. Centering these animals to discover the link between these intimate histories and the big events is also an important step in the process of decolonizing our narratives. Moses Brings Plenty, Director of Rangeland Relations for CANA Foundation and spiritual leader of rewilding projects, argues that relationship—not domestication—is the heart of indigenous human-animal interaction. Animals don’t just symbolize the past, they carry historical memory, and when he, as a descendent of Sitting Bull, sits on his Nakota horse, descended from Sitting Bull’s herd, that memory reawakens. Across the archives, historical animals are waiting, ready to assist in that awakening. Susan Nance, ed. The Historical Animal. (Syracuse, NY: Syracuse University Press, 2015), 3. John M. Carroll, ed. The Frank L. Anders-R.G. Cartwright Correspondence, Volume III. (Bryan, TX: J.M. Carroll, 1982), 52. Moses Brings Plenty. Interview by the author. January 31, 2018. For more on his work, follow Brings Plenty Band on Facebook and Twitter. For an example of the indigenous cultural programs that participate in rewilding, follow Natsu Puuku on Facebook, Twitter, and Instagram. Lindsay Marshall is a doctoral candidate at the University of Oklahoma where she studies the connection between public memory, K-12 education, Native history, and the history of the horse in the U.S. West. Her M.A. work at Stanford University focused on German public memory about the Holocaust through film. She also serves as social media director for Natsu Puuku, a program dedicated to preserving wild horses and teaching Comanche horsemanship in Oklahoma. Her scholarship seeks to re-center Native people and Native history in North America’s historical narratives and public memory. I am very interested in your work in general, and especially in your comments on the horses at the Little Bighorn. I’d love to see more about this. What a fascinating line of inquiry. Great work. Carry on.